Are you tired of wearing wrinkled clothes even though you ironed them? Stop ironing your outfits on your couch or on your bed. Don’t let the lack of ironing set your style back. All you need is a quality ironing board to straighten out your clothes. An ironing board is a must-have in any home. Ironing may not be an activity that everyone enjoys, but it is very essential to be able to look presentable. Although, most boards may look the same, there are differences in quality, functionality, and durability. Knowing the best option can spell the difference between wrinkled clothes to well-ironed ones. From length, width, structure, covers, and more, know how to pick which board is the best for you by following the guide down below. The first aspect one should look at when buying an ironing board is the length. Shorter boards may take up less space in your home, but they can increase ironing time too. The longer ironing boards will allow you the much-needed space to work with most of your clothes. Aside from that, you must decide what type of nose your board should have. There are three types of noses: rounded, tapered, and blunt. Choose wisely based on your ironing, storage, and budget requirements. The next step is to check the cover material. Keep in mind that the cover must be able to cope with high temperatures to avoid melting. Cheap covers will melt and stick to your clothes thereby ruining them. Aside from the cover, board padding is also very important. It will be difficult to iron out clothes if the padding is too thick or too thin. The best padding is within 4 to 8 mm to make ironing faster and easier. The less time it takes to iron your clothes, the better your ironing board is. Lastly, your ironing board should be stable. It must not move or bobble to avoid accidents. So, check the structure of the legs and the folding system. The metallic legs should be light, but solid enough to be able to carry weight without bending. It must be balance so you can work throughout the length of the board. The board itself must also be smooth and well-made. Make sure to check every part of the board before you spend money on one. There are also available accessories to make the choir of ironing easier. Check them out and see if they will work well with your board. Remember, a well-built, high-quality ironing board should last for years. You will only need to replace the cover every couple of years, making buying a high-quality ironing board a good investment. So, with this guide, find the best ironing board to match your clothing style, hobbies, and lifestyle. Read on to discover the 10 best ironing boards of the year. Are you looking for a better ironing board cover? Don’t settle for less, with Whitmor 6880-834-PRGNTQPL Supreme Scorch Resistant Ironing Board Cover and Pad, your ironing will become easier and faster. The cotton fabric of the cover is durable and resistant to scorching to create a smooth ironing surface. The cover is sewn together with the pad and is equipped with drawstring cord and barrel lock for a secure fit to your ironing board. Ironing can be hard especially if the cover of your ironing board is of low quality. With the Whitmor 6880-834-PRGNTQPL Supreme Scorch Resistant Ironing Board Cover and Pad, you will not only get a cover that resist scorching and stains, you will also make your chore faster and smoother. This ironing cover is designed to fit with almost all ironing board sizes plus it is equipped with drawstring cords and barrel lock for a snug fit. Minky Ergo Ironing Board is not only designed for functionality, but also with comfort in mind. This UK-designed and made ironing board helps take out the strain of ironing. It is developed to be used in the most naturally comfortable ironing position for both left and right handed users. It features the Bespoke Prozone, a heat reflective cover, to cut ironing time into half. The flex guide also prevents tangling and snagging of wire for a smooth and easy pressing. 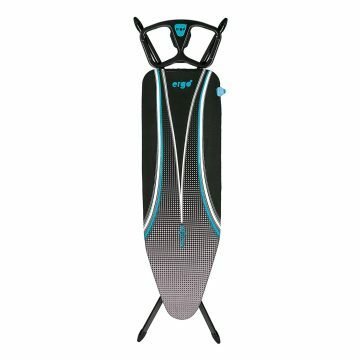 With its design, stability, and durability, Minky Ergo Ironing Board is truly one of the best ironing boards in the market. For durable and stable ironing board, Minky Ergo Ironing Board is one of the best. Features broad and strong legs to support even heavy garment, ironing bed sheets and pants is no problem. The heat reflective cover also helps you make ironing faster and smoother, and at the same time, it is designed to make ironing less straining to the arms and shoulders of users. A very good value for its price! Do you feel tired of having to lug around your heavy ironing board? Experience the convenience of Honey-Can-Do BRD-01350 Over-the-door Ironing Board can give. This space-saving ironing board can be installed onto one of your doors. There’s no need to carry it around as you can simply unfold it to use and fold it back up again to store it. It features adequate ironing surface and 100% cotton backed with thick foam for easy pressing of those wrinkled garments. For quick ironing of shirts and other light garments, the space saving Honey-Can-Do BRD-01350 Over The Door Ironing Board with Folding Design will do the job. Very light and portable, you can easily install this ironing board to any doors in your house. With its safety locks, you can rest easy that this ironing board will not unfold itself when you open and close the door that it is attached on. 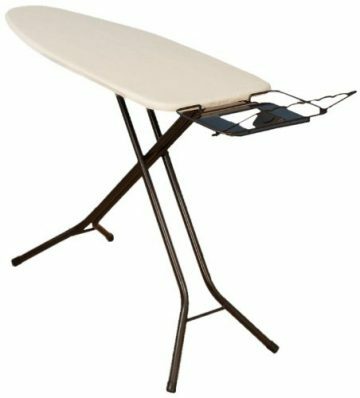 Press your garments and clothes into great condition without having to lug around heavy ironing board with the Household Essentials Steel Table Top Small Ironing Board. Small, compact, and light, this ironing board is easy to set up on your bed, on the table or on any other flat surface. The ironing surface of this board features 100% cotton and thick fiber padding for a matte-free pressing. This stable ironing board is easy to store and use. It can even be stored next to your washing machine and dryer to quickly press your newly washed and dried clothes. Although, it has a small ironing surface, the Household Essentials Steel Table Top Small Ironing Board is very stable enabling you to easily adjust large clothes like pants. The iron rest is also large enough to hold any size of iron. Take your ironing off the floor with the Household Essential 144222 Over The Door Small Ironing Board. As its name suggest, this board is attached to your door using hooks. For stability, the ironing board features a support feet. It also has a built-in iron rest to add more convenience while you iron your clothes. 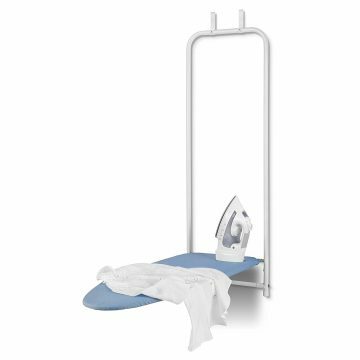 If you are looking for the ultimate space saving ironing board, the Household Essentials 144222 Over The Door Small Ironing Board is the one you want. 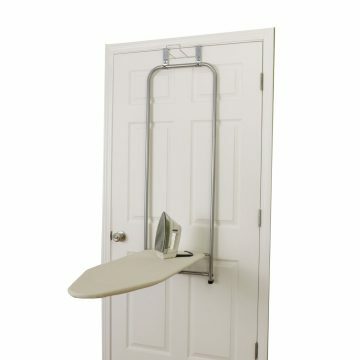 This ironing board is very easy to install on to your doors. Simply attach the hook and it’s ready for ironing. For support, the ironing board has a “feet” to stabilize the board while you are ironing your clothes. With this board, will only have a board to press your garments, but also save space in your place! 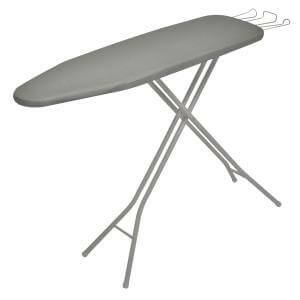 Stable and sturdy describes Household Essentials Extra Wide Top 4-Leg Large Ironing Board. With wide ironing space, you will be able to easily iron out garments of all sizes. The ironing board also features extra space for iron rests and for your hanger. It is also very easy to store with foldable leg locks. 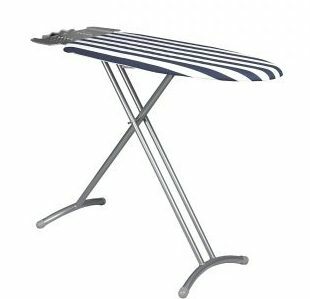 The Household Essentials Extra Wide Top 4-Leg Large Ironing Board is worth the investment, what with its sturdy 4-leg stance and wide ironing space. It also comes with added bonuses of an iron rest with heat resistant butterfly pad and a fixed hanger space. It may be a bit heavy, but it will only take minimal space in your storage area. This ironing board is ideal for people who are looking for a stable and durable, as well as space-saving ironing board. The Laundry Solutions Compact Ironing Board features very stable thick steel legs that can sustain extra weight. You can also easily adjust the height through the adjustable paddle with leg locking device. The ironing board also features an extra space to hold your iron and an extra space for your hanger. If you are looking for an ironing board that can save space, this is the one you are looking for. With proper care, Laundry Solutions by Westex Compact Ironing Board can be the long-term answer for your ironing problems in confined spaces. With adjustable leg paddles and a leg-locking system, you can iron in comfort. Smoothen out the creases in your garments on this stable and space-saving ironing board! Household Essentials Collapsible Presswood Tabletop Ironing Board is the answer for people who are looking a space-saving ironing board. 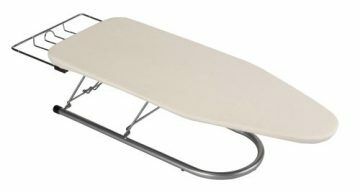 The collapsible ironing board features compact steel legs that can fold up to the presswood, making it flat and easy to store under the bed or behind doors. The presswood board also features a tapered nose and a rounded end to help in ironing shoulder creases in shirts. It comes with 100% cotton cover, too, that is a 5mm foam pad. If you live in a small apartment and want to buy an ironing board, this collapsible presswood ironing board is perfect for you. Portable and lightweight, you can use the board on your table, use its legs, or even position it on top of your washing machine if space is really an issue. It already comes with fabric cover and padding so you can instantly use it. Fold and store it under your bed, in your closet, or behind your door. This ironing board cover is scorch resistant and will fit most standard size ironing boards. In fact, it can fit ironing boards up to 15 by 54-inch. Its elastic tailored nose will help secure the one-piece pad and silicone coating cover in place. The cover will help you smooth those wrinkles in no time. The ironing board cover comes in varied colors as well to fit your style. 100% cotton and silicone padded to help make ironing smoother. Elastic tailored nose to help secure the cover to the ironing board. Very easy to fit and makes your ironing easier. This silicone coated ironing cover allows garments to slide without clinging to the cover. Also, because this is a scorch resistant ironing cover, you will have no problem with steam stains. It fits standard ironing board sizes. Equipped with Epica silicone coating and heavy duty padding for durability and scorch-resistance. Secure and non-slip cover fit. Epica Ironing Board Covers are secured with elastic edges and Velcro straps. This Epica silicone-coated ironing board cover can withstand high heat and reflect it back to the clothes. It is like you are ironing both sides of your clothes at once, and so you can cut your ironing time into half. Stubborn wrinkles will not be a problem as this cover allows for smooth pressing. With the thick padding attached to the cover, taking it on and off will be an easy job. Its elasticized edges and dual adjustable Velcro straps will also allow you customize the fit and avoid shifting and spilling. Easy and quick to put on and take off. No risk! Full 2 years of warranty. With high heat resistance and the ability to reflect heat back to the garments, this cover will help you make your ironing faster and easier. There’s also no risk involved as the Epica silicone cover has a two-year warranty. You can get your money back if the product does not perform to expectations within a few weeks of buying it. Ironing is a one of the most time consuming and hassle-filled household chores. But, with the help of any of these ironing board and cover products, ironing can become faster and smoother.